Have you discovered Skyroom? Newlite offer you the latest innovation in glazed extensions, orangeries and conservatories. 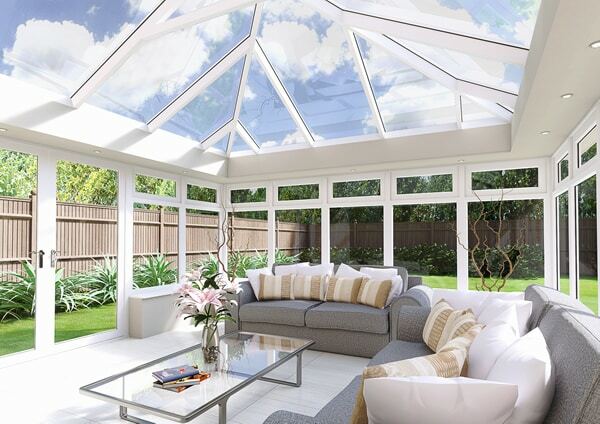 Skyroom has been designed to create a crossover between a traditional conservatory and orangery. 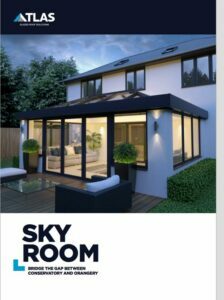 Skyroom offers a contemporary version a glazed extension bringing excellent engineering, sophisticated looks and design and is very affordable. Offered as an elegant, strong and slimline roof system that is comfortable to use all year round, creates a truly usable living space and is far superior to a traditional bolt-on conservatory. Skyroom provides a whole host of benefits for your home. Newlite is an approved installer of the new and unique Skyroom system. We believe this is one of the best and most attractive products of its kind offering many advantages. Expanses of glass letting in light. A sleek and contemporary roof and structure. Replicates an Orangery if needed. Externally, Skyroom also benefits from the same slim lines, with no visible bulk, no visible tie bars or pelmets often round in other similar roofs. A wide choice of colour and much more. You can choose from a huge range of powder coated colours for your Skyroom. With such a wide colour choice you can choose from white, grey, bold or bright colours and even different colours inside and out. Skyroom benefits from aesthetics similar to a traditional orangery, but better. We set our Atlas roof within a solid roof arrangement with a feature raised ring beam. Additionally the roof can be adapted for lighting, speakers, ventilation and much more. You will benefit from a sleek and contemporary roof that has no unsightly bolt ons, supports and beams. All of this helps keep your roof discreet and let in the light you expect from your new glass roof and structure. A choice of glazing options. You can choose from high specification double glazing all with safety glass or even sophisticated triple glazed units. Whatever you choose will control solar gain, keep you comfortable all year round and be energy efficient. The latest in contemporary Orangeries and glazed extensions – Skyroom. Contact us and let us demonstrate to you how the very latest in roof technology and orangery design will transform and add value to your home.